The Avilés canyon, along with the Corviro and La Gaviera canyons, make up a system of submarine canyons located to the north of the Asturian coast. 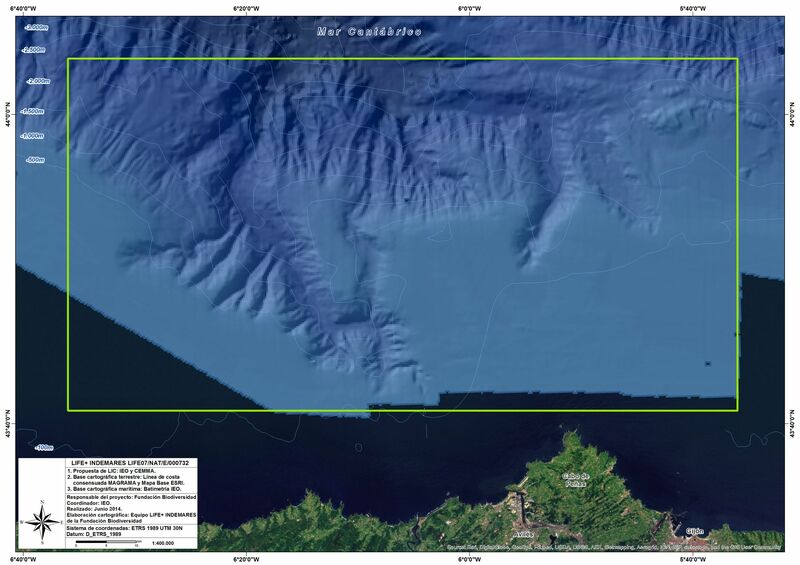 This system leaves the continental platform at a depth of 140 meters in the form of three large canyons and more than 12 tributary canyons that join together and flow onto the Bay of Biscay abyssal plain at a depth of more than 4,700 meters. The biodiversity in these submarine canyons is very high and more than 1,300 bottom-dwelling species have been inventoried to date (not including pelagic species), some of which are very vulnerable, like the corals, sponges and deep water sharks, and which are included in diverse protection regulations, even though they tend to occupy very deep waters. Reefs are hard, compact substrates on smooth, solid bases that rise from the sea floor. They can shelter benthic communities of animals and seaweeds, as well as coralligenous concretions. The reef's main structural species are the white corals Madrepora oculata and Lophelia pertusa. These significantly increase the complexity of the habitat as they are accompanied by numerous other species of gorgonian sea fans, black corals (antipatharians), glass sponges, echinoderms, crabs and fish, raising the level of biodiversity in this habitat considerably. It has also been confirmed that these reefs are a critical habitat for certain commercially interesting species that are subsequently exploited in shallower fishing grounds on the nearby continental shelf, so their conservation is a priority for ensuring the sustainability of the fisheries on the Asturian coast. Cosmopolitan species typical in tropical and temperate regions, although it may also be found in relatively cold waters. It is characterised by being very gregarious. Its very varied diet includes hake, sea bream, mackerel, octopus, squid, and prawns, among other marine animals. This canyon system comprises a feeding zone for several species of cetaceans. Nevertheless, the most-sighted species is the bottlenose dolphin, which travels through the area on its way between the population centres on the western Cantabrian coast and the eastern region of the Bay of Biscay. Species typical of the temperate and cold waters found in the oceans of the northern hemisphere, which usually lives in shallow zones close to the coast. In Spain, it is only found around the Atlantic coastline. The Avilés canyon system is, along with the Gulf of Cadiz, the only INDEMARES zone where this species has been recorded. Cosmopolitan species found in tropical and subtropical waters. Solitary and omnivorous, its diet includes crustaceans, fish, molluscs, seagrass and jellyfish. Occasional sightings of individual loggerhead turtles have been made in the Avilés canyon, however, more data is needed to determine in what way they use this area.